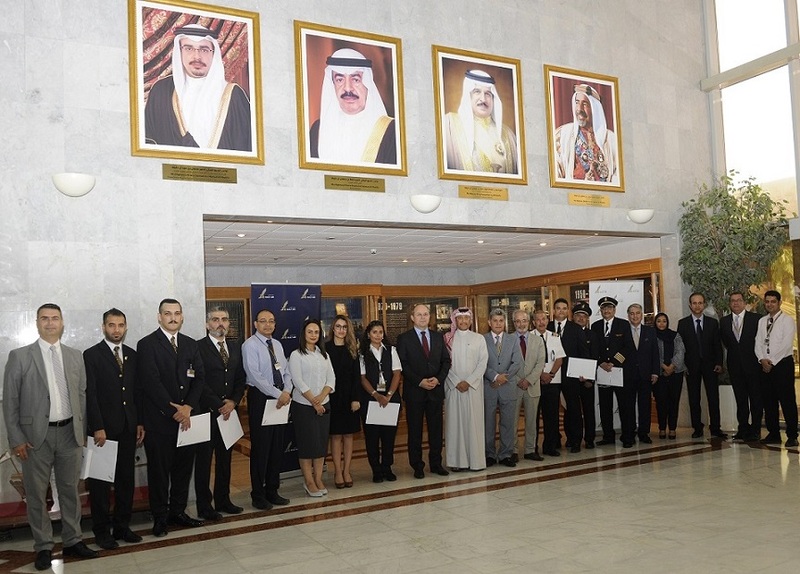 Gulf Air, the Kingdom of Bahrain’s national carrier, has rolled out a “High Flyer” award scheme whereby the airline recognises and honours employees who perform their duties at an outstanding level of service. Gulf Air Chief Executive Officer Mr. Krešimir Kučko and Deputy Chief Executive Officer Captain Waleed Abdulhameed AlAlawi, alongside members of the airline’s executive management team including Gulf Air Director of Human Resources Mrs. Nouf AlSowaidi, congratulated the honored staff in a dedicated ceremony at the airline’s Muharraq headquarters. The celebrated staff included members of Gulf Air’s maintenance, technical, marketing, sales, human resources and operations departments. Gulf Air’s “High Flyer” award scheme, established this year, recognises the efforts of employees who consistently display a superior level of commitment, accountability, positive attitude and ability to embrace change. It takes into consideration a range of business accomplishments and achievements in terms of customer service and teamwork and recognises individual and team efforts across Gulf Air’s global operations.